MANILA, Philippines - Contrary to earlier reports that the November 2016 bar exam results are out before Holy Week, reliable sources from the Supreme Court (SC) said today of the target release which is on Tuesday, May 2 or after the special en banc session. The 2016 bar exam results will come out after the SC's month-long summer session, which has started today (April 3) until April 28 in Baguio City. On May 2 at 9:30 a.m., the High Court is expected to deliberate the passing percentage and decode the result. 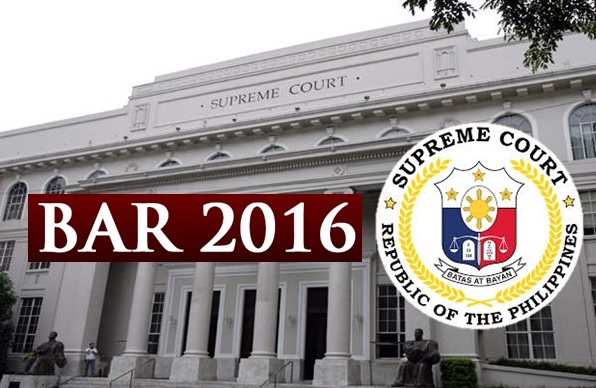 April 26 UPDATE: 2016 Bar exam results out on May 3 - Supreme Court. Same with previous years, the complete list of passers and topnotchers will be posted on SC website and may be viewed at the SC quadrangle few hours after the session unless a "serious" matter arises from the deliberation. In a report by Manila Times and DWIZ AM radio, SC Associate Justice Presbiterio Velasco, Jr., chairman of the 2016 Bar Examinations, reportedly told the SC en banc of a higher passing rate for the 2016 bar, around 40%. "Several SC justices supposedly believe that the country needs more lawyers," a statement told to Manila Times. It further says that it depends on actual number of examinees who can get the 75% passing percentage in all of the eight bar subjects. In recent years, the annual national bar passing rate ranges from 20% to 30% only. Meanwhile, Public Information Chief Atty. Theodore Te has denied the speculations, claiming that the court has yet to determine the target percentage. The SC has set the oathtaking for all bar passers on May 3 at the Philippine International Convention Center (PICC) in Pasay City. A total of 6,344 law graduates completed the tests on the four Sundays of November 2016 (6, 13, 20, and 27) at the University of Santo Tomas in Manila. The examination covered the following topics and their associated subtopics: Political Law and Public International Law, Labor and Social Legislation, Civil Law, Taxation, Mercantile Law, Criminal Law, Remedial law and Legal and Judicial Ethics. In 2015, 1,731 (26.21 percent) out of 6,605 passed the examination. Rachel Angeli B. Miranda of the University of the Philippines topped the bar with 87.40 percent.